-Chances for the Leakage of Amniotic Fluid! Now that you are 32 weeks pregnant, you enter into the phase where any indication or pain can be ‘labor pains’. So, from this week onwards, you should be very careful in each and every thing that is happening with you. There are some changes that take place in you and your baby during this week. It is the time to monitor the baby’s movements with very much attention and at the same time it is the time to consider who will be near you when you give birth. You must be very careful about lightheadedness during these last weeks of pregnancy. Your blood tends to pool in your lower limbs thus resulting in low cranial blood pressure. So, it is better to watch out for the head conditions and get up for small walk after sitting for prolonged periods. Are you beginning to waddle? ‘Relaxin’ is the pregnancy hormone, mainly responsible for the softening of hip joints that make you move differently. Large uterus does not support your walk, it discards your posture and causes you to have swayback look. It is perfectly natural to feel increasingly tired, to have trouble breathing and also to not be able to move as fast as you used to till last week. You must keep in mind that the due day is close and the best idea you can have is to rest as much as you can. During the 32nd week of pregnancy, you should be aware of some potential complications such as ‘placenta previa’. This is a very serious condition, but it is most common in pregnant women who have more than one child. In this condition, the placenta blocks or slightly blocks the cervix. The pressure of your baby on the placenta can lead to painless bleeding during the last trimester of your pregnancy. If there is complete obstruction, then it needs a cesarean section. Another condition you should be aware of is abruption placenta in which some part of the placenta separates from the wall of the uterus. This condition can lead to mild pain and also bleeding. If you experience any of these conditions, it is very essential to call your doctor. Your blood volume in pregnancy week 32 is roughly higher by about 50 percent than it was before your pregnancy, which is necessary to support your growing baby. But, if you experience any 32 weeks pregnant symptoms like sudden weight gain, headaches, swelling in your hands or face and any vision changes, then these are the signs of preeclampsia. This condition can cause high blood pressure and protein in your urine. If you experience any of these conditions, immediately call your care provider. These can affect both you and your baby. During week 32 of pregnancy, your uterus is about 5 inches above your navel and is pushing your organs every way leading to constipation, heartburn, breathlessness and indigestion. It is important that you continue to consume lot of water and high fiber food. Take adequate rest and try limiting your work pressure on yourself. Regular prenatal visits are very important during this time. Regular screening of your blood pressure, urine, and any swelling that may develop are very important. Monitor the baby movements with great care. If you are worried because you do not feel the little one lie on your left side and the baby movements are lower than 10 in one hour, contact your care giver. Few indicators that indicate you are experiencing real contractions and you start going into labor are: diarrhea, dropping of your baby, weight loss, high blood pressure, upset stomach and increase in frequency of contractions. Drink more and more water and fluids. Consume adequate fiber to ease the constipation and take frequent and small meals to reduce the heartburn and also indigestion. Do not wear high heels for they will aggravate the back pain. Sleep in a slightly elevated position and when you sit, put a pillow behind your back. Elevate your legs to favor the blood circulation. Avoid standing for long whiles and make sure you have somebody with you when you go out. 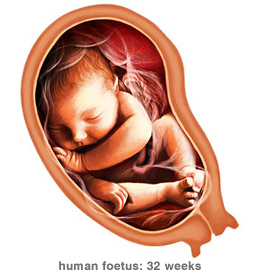 By this time, your 32 week fetus is about the size of 18.9 inches long and weighs up to 4 pounds. Your baby has less and less room to move; so the movements will not be as strong as you were used to. By week 32 pregnancy, your baby will have matured lungs and a strong immune system. Your amazing baby now develops sensitivity to the temperature, which means if you keep a hot pad on your belly, immediately you will get a swift kick. Your baby can move the head to the side, but when the baby becomes large, the movements will slowly decrease, which can be seen in 32 weeks pregnant ultrasound. According to research your baby even has REM (dream sleep) which starts from the 8th month onwards. By now, all the five senses of your little one are working. Toe nails have completely formed by now and the hair on your baby’s head is continuing to grow. The baby opens its eyes and can focus its gaze on a fixed point. If your baby is a boy, then the testicles will have moved into the scrotum. Do you know about premature rupture of membranes (PROM)? About 15% of the pregnant women can experience this condition. More likely, your water will break at some point during the labor, generally between 4-7 centimeters dilation. Even if your water breaks early, you will experience a slow leakage. If you notice any increase in the discharge or a sudden attack of incontinence when you are in 32nd week of pregnancy, consult your practitioner immediately to know whether or not your water has broken. Find out what to expect when you are 33 weeks pregnant. 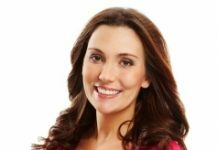 Previous articleHow To Prevent Heartburn During Pregnancy? Some time i am facing the urination problem and painless bleeding.why its happens to me?